Many people in France make payments by check or by bank cards. 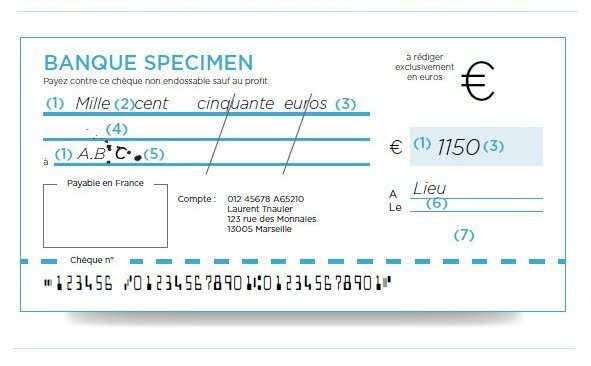 In France, you are given a check book “un chéquier“ or “carnet de chèques” when you open a checking account “un compte chèque”. When you write a check “un chèque” you need to make sure that your bank balance “solde du compte” is enough to cover the le chèque. On “un chèque” you will find the information for your bank known as “un relevé d’identité bancaire (RIB)”. You will need to ask a RIB from your bank. You need to give a RIB to any company or organisation that you want to do direct deposit or direct withdrawal “prélèvement” from your bank account. This includes your employer or the phone company etc. How to fill out a cheque in french “Comment remplir un chèque en francais”? 1. The first line and second line are for the amount that you would like to pay. The expression “payez contre ce cheque non endossable” or something similar is found at the begining of the first line. Starting at the first line, write at the beginning of each line the amount out in words, in euros and cents. 2. The third line is reserved for the name of the person that you are making the check out to look for “à “. Write the name of the person or company to whom you are making payment to. 3. On the right hand side of the check you will see a Euro sign with a little box, here you need to write the amount again but this time in numbers. It is not necessary to write euro again since it is already printed at the beginning of the box. 4. directly under the box or under the box but towards left you will see a short line with another “à”. This line is for you to put the date. Date format in France is month/day/year. You can choose to write to 04/09/2013 or September 4, 2013. 5. beside or below this line, you will find another short line that starts with the word ‘le” . Here you will need to write the name of the city or town in which you were when you wrote the check. 6.after you need to sign your check. Your signature should be identical to the one that you used to oped your checking account. When you receive a check in France you need to endorse “Endosser” your check, meaning that you sign the back “signer au dos” of the check. before depositing it. You will also need to fill out a “bordereau de remise de chèques”. Some banks put them in the back of your check book but you can also ask them from your book. They are normally free. deposit have to be made a the bank that you opened your account. You cannot deposit your check at any other bank branch even if it is the same bank.